It's Q4 of 2018, and now is the time to start planning for 2019. What is the BIG vision for you and your business in 2019? Is your "Why" helping you to drive your vision forward? It's time to create your vision and plan for 2019. We're going to spend some creative time together to layout your dreams and put them into action for 2019. Join us for a fun afternoon / evening of creative training for you to feel inspired, motivated and excited for what's to come in 2019. 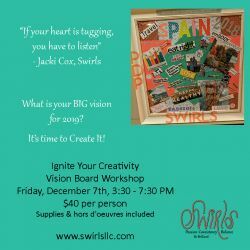 Come for a bit of networking, creative coaching from Jacki Cox, and TIME to create your vision board. Supplies will be provided. Please bring some extra magazines if you have something that is speaking to you. 4:30 - 7:30 PM - It's time to create, enjoy some holiday cheer, mingle with amazing people and bring in your excitement for 2019!